What's best to do when you wake up at 4am? BAKE! Nothing says a good morning better than some warm breakfast muffins. I had had a flu for the last couple of days, and have been living on hot tea with honey. So this morning I wanted some warm muffins served with honey. 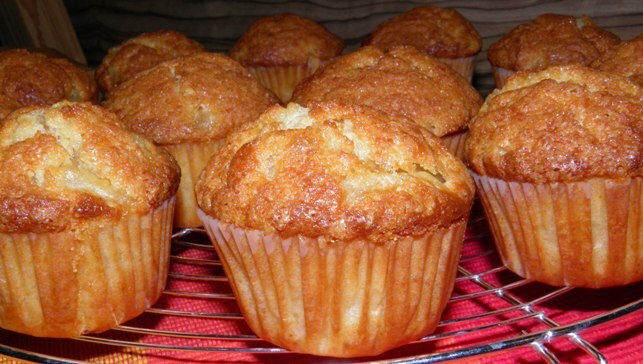 And looking at what I have in the kitchen, I figured I could simply make pear and honey muffins. They were SO GOOD, especially when they are still a little warm. I used a very ripe pear so the muffins are very fragrant. As the muffins are very sweet already, don't smear it with any more honey - unless you have a very big sweet tooth, of course. Perfect muffins for this misty fall morning. 1. Heat the oven to 200 degree C, and line muffin tin with 12 muffin cases. 2. In a large bowl, mix together all the dry ingredients (flour, baking powder, caster sugar, brown sugar, and ground ginger). 3. In a measuring jug, whisk together the sour cream, oil, honey and eggs. Then fold into the dry ingredients. 4. Mix in the diced pear, and divide the batter evenly between the muffin cases. 5. Sprinkle each one with 1/2 tsp of brown sugar and bake for 20 minutes. Remove to a cooling rack.